Valley Child Care Phoenix understands the importance of appropriate educational experiences and their role in the success of your children as they develop and grow. We offer a variety of developmentally-appropriate educational programs to help prepare your child for the challenges of kindergarten, first grade and beyond. We provide a nurturing, caring and responsive atmosphere for your infant to thrive. Infant education is pursued using soft toys, colorful books and music that enrich the surrounding environment. The toddler years are an exciting time when children are not only beginning to understand language, but also to think through their actions and solve problems. We know that good toddler care entails offering new experiences in a secure, supportive and nurturing setting. Each day, you will receive a daily report on your child's progress and notes on care routines like eating, napping and diapering. Two-year-olds love exploring and discovering new things! We encourage them to do just that with educational toys, play materials and self-directed activities that will also develop their sense of independence. His or her growing vocabulary and self-expression will be nurtured by reading aloud, reciting nursery rhymes and singing songs. Each day, you will receive a daily report on your child's progress and notes on care routines like eating, napping and diapering. 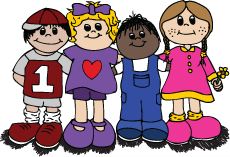 A great preschool curriculum will prepare your child for kindergarten, first grade and beyond. Preschool age children are making friends and sharing the fun of learning with other children. Our teachers are committed to the nurturing and encouragement of your child as he/she develops through preschool math classes, language arts, music activities and more. 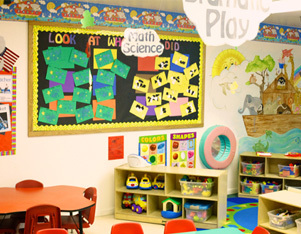 Each classroom is divided into Learning Centers such as Language Arts, Circle Time, Math and Art. Each center invites your child to explore and marvel at the wonders of the world around him. No matter which area captures your child's interest on a particular day, he's developing important skills. Children begin their day at Valley Child Care Phoenix with Circle Time activities like storytelling, singing songs, show-and-tell time and matching games. These activities give children a chance to express their ideas in words and to connect the written word with spoken words. Our preschool math curriculum will teach your child sorting and counting skills, how to put things in order and much, much more. These basic math skills are wonderful tools in the development of problem solving skills. Here your child will learn to differentiate between big and little, large and small and same and different through basic math activities. The science center gives children hands-on opportunities to explore the physical world. Children use magnets and magnifiers, interact with living things, and play at sand and water tables. Young artists are given the freedom to learn through handling, pulling, twisting, tearing, bending, scraping, cutting, pounding and shaping materials. Art helps preschoolers learn about form, balance, line, color, shape and relationships between objects. Through creative art, children also build observational and motor skills, learn logical thinking and practice problem-solving. Children love to play with building blocks, and this is one activity that can play an important role in their development. Hand-eye coordination, hand, wrist and finger control, math skills and problem solving skills all advance through the trial and error process of playing with blocks. Blocks are one of the most popular items in our Learning Centers because they represent such a fun and challenging way to learn and grow. Imaginations expand with the help of dress-up clothing, child-sized furniture and other props. They try new careers, learn to share, and make friends. Children also learn life skills like turning knobs or buttoning and zipping clothes. Children will learn to express themselves via the power of imagination.